My name is Cole Manganaro. I have been helping my Dad serve the homeless and indigent population since November 2013. Recently, I was in a situation where I realized that some of the children we were getting to know through our outreach did not have any toys. I had just left a birthday party and realized that I had been given a party bag with clay sticks in it. I decided to give them the clay sticks to one of the little girls. She looked so surprised. I asked her to make sure she shared the sticks with the other children. 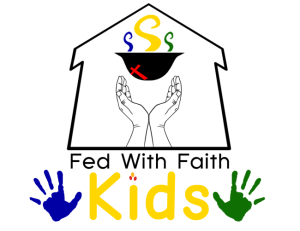 When I got back into the car with my Mom, I told her I had to start Fed with Faith Kids. I wanted to make sure that all children had a toy or two. They also need clothes. My mom suggested I should ask for bathing things for children too. A couple days later, my mom asked me if I knew what a mission statement was. I didn’t, so she explained it. She asked me what I wanted my mission to be. She helped me put it in more grown-up words, but I really just want to see other kids be happy like I am.